Tumbelweeds is the guy on that cover, falling off his horse. Man, did Tom K. Ryan draw weird horses. The strip relied heavily on the ideas “American Indians are inherently ridiculous” and “ugly, man-hungry spinsters are an endless source of hilarity.” I have not read it in a long time, but I suspect that it has not aged well. Here is a trivia challenge for you: Was does this strip have in common with “Fantastic Four”? The answer is that both had characters based on John Carradine. In “Tumbleweeds,” one of the characters was a professional gambler, clearly based on Carradine in the film “Stagecoach.” In the third issue of “Fantastic Four,” the villain Miracle Man is unmistakably drawn to look like Carradine in his horror roles. Yeah, this is pretty much my childhood. I still have a box of Peanuts and a box of Doonesbury paperbacks (including Action Figure which came with, well, an action figure of Uncle Duke). I loved those books as a kid (I had that very Peanuts you posted, as well as a partner one with a green cover). I used to go to garage sales with my mom on Saturday mornings and would usually be able to pick up a couple of the comic strip books for a quarter. I had quite a collection! I’ve also found my kids enjoy them too–tough to find new ones, but old ones are available in a variety of places for not much money. My kids prefer Peanuts (as they should), Wizard of Id, and Fred Bassett. They are somewhere between indifferent and actively disinterested to B.C., Blondie, Beetle Bailey, Dennis the Menace. My wife wouldn’t let me show them the really awesome Andy Capp book due to every strip featuring either ale-drinking or wife-beating. I also had a lot of the Peanut books. For some reason I liked Crock, along with the other Parker/Hart strips. But the paperbacks I REALLY loved were the Mad books. I didn’t have many, as my mom didn’t care for those. 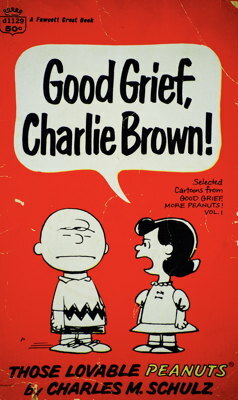 My folks had many of these reprint books of Peanuts and a Sad Sack or two. 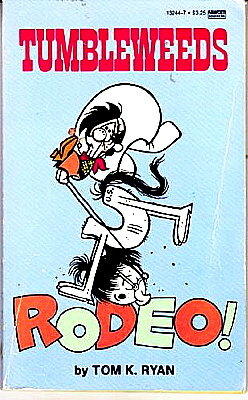 But they also had one Pogo book which was really my only exposure to the strip for years. I flipped back through it and noticed that a few drawings that were not part of the strips. To my uneducated eye, they appeared to have been created for the book to either bridge the strips or emphasize something. When the Complete Pogo series was announced, I wrote Fantagraphics asking if these would be included but never heard back. I re-read those to pieces. I also had many pf those paperbacks. Adam, you’re right that some of the art in that Pogo book never appeared in the strip (the bit with the elephant, the donkey and the gingerbread man), but was created for the second Pogo softcover, I Go Pogo. Gordo likewise had extra art in his first compilation, so much so it became uneconomic to continue. As for Tumbleweeds, the early years are the best. Ryan did some impressive action shots, but as time went on he just got lazy. My mother’s favorite character was Clodwell Gunkley. (“Hi ho!”) Incidentally one of Jim Davis’ early jobs was as assistant to Ryan. You can see similar rhythms in Garfield and Tumbleweeds. We had a lot of paperback reprint comic strip books! I loved them! Peanuts, Wizard of Id, BC, Andy Capp, Garfield, Doonesbury, then Bloom County, Foxtrot, then buying my daughter Big Nate and Cul De Sac! I had one Tumbleweeds book, and it was in one of our daily papers. It took a while, but the strip really grew on me. Ryan created some unique characters, even though the strip was based on cliches of movie and TV westerns. Early Family Circus was actually really good. For me it was Bloom County. A thousand jokes must have gone over my head but my god did I love it and have all the books (even the ones that overlapped the others which was so annoying as a kid). I can’t say it hasn’t helped me, it’s the reason I know who Phyllis Schlafly is and that’s something. Early Tumbleweeds was a pretty good strip, based on the paperback I found in a used book store. So good that I tracked down a big compilation of Ryan’s later work … and it wasn’t nearly as charming or funny. Plus, the mechanical lettering, ugh. 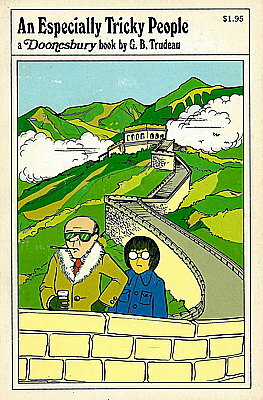 I bought a couple of Doonesbury comps from 1976 in the early 90s. One involved all the characters in the American Revolution (that Bicentennial thing, ya know). Jokes about Colonial Zonker were pretty funny–pretty sure he worked on Washington’s hemp farm. Another had a lot about the Vietnam Airlift, when hundreds of kids left orphaned by the war were taken out as Saigon fell to be adopted in the US. It took a while for it to sink in that the adopted character was a girl named Kim. 20+ years later–she married Mike. Now THAT’S continuity! Bill the Splut, you just blew my mind with that bit about Mike’s wife Kim being the same little girl. Amazing. I wonder if there’s ever been another strip with more careful continuity than Doonesbury? The fact that someone up there is talking about the Duke related Doonesbury collection that came with an action figure was part of their childhood just makes me feel really damn old. Doonesbury’s continuity was fantastic, and the Kim thing-I first saw her in the late 80s or early 90s as a teenager, dealing with people making racist assumptions about her in high school, but I’m not shocked she appeared earlier-is an amazing example of it. I started reading Doonesbury in 1988 or so, with a series of strips talking about Al Gore’s run for president, and I will never forget the strip that started my run with Sam Nunn clearing his throat and the caption that read “His understudy froze in horror.” God I loved that strip.